Their love for early 50’s Rock ‘n’ Roll and Rockabilly brought The Booze Bombs together a couple years back. They are the hottest rockabilly band in the Black Forest region as well as Southern Germany. They really heat up things when they perform their rip roaring Rock ‘n’ Roll and wild authentic rockabilly sound. Lucky Steve (guitar/vocals), Frank Martinez (upright bass) and Rockin´Bende(drums) are complete with the charismatic Italien leadsinger Annie Leopardo. Her powerfull voice will just about blow anyone away. Her vocals reminds on Rockabilly Queens like Patsy Cline and Wanda Jackson. She’s a must see for sure. 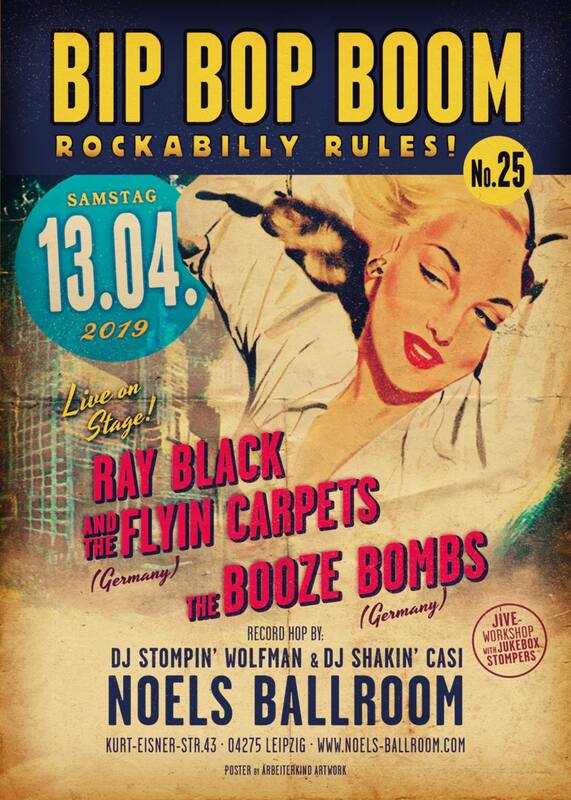 Germany’s Rockabilly band The Booze Bombs has been touring a couple of times in the USA, Australia and Europe and have developed an impressive fan base. Ihre Leidenschaft für die Musik des frühen 50’s Rock’n’Roll und Rockabilly brachte die vier Musiker der Booze Bombs zusammen. Seitdem präsentiert die wohl heisseste Rockabilly-Band, die es im Nordschwarzwald und im Süden Deutschlands gibt, wilden authentischen Rockabilly und traditionellen Rock’n’Roll mit einem originellen Sound, der jede Veranstaltung zum Explodieren bringt. Das geniale Herrentrio wird vervollständigt mit der charismatischen Leadsängerin Annie Leopardo. Ihre ausdrucksstarke kraftvolle Stimme, die zum Teil an Rockabilly-Ikonen wie Patsy Cline oder Wanda Jackson erinnert, haut jeden um. Neben einer groen Anhängerschaft in der europäischen Szene haben sich Lucky Steve (Gitarre/vocals), Frank Martinez (Kontrabass), Rockin´Bende und last but not least Miss Annie Leopardo (lead vocals) durch zahlreiche Tourneen eine grosse Fangemeinde in den USA erspielt. The outcome is a highly driven performance, that is danceable, whether you want to bop or to jive and shows the uncompromising dedication of the four bandmembers Ray Black (Singer, Upright Bass), Martin Bone (Lead Guitar), Howlin’ Herbst (Rhythm Guitar, Baritone), Boz Doz (Drums) to what they do, on every stage that they enter. The band is based in Stuttgart (Germany), but has played all over the country and in Austria, Switzerland and in France. All band members are active musicians in the scene, playing with The Hidden Charms, The Railbones, Dusty Dave & The Heartattacks or Blue Rockin’ so you certainly could have seen them on stage before.